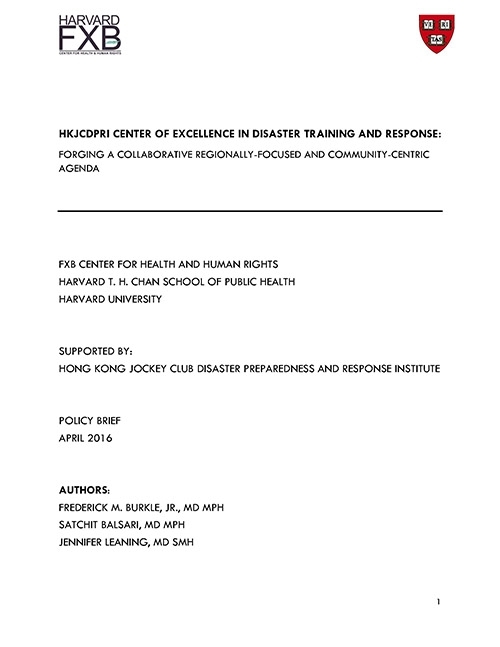 The Hong Kong Jockey Club Disaster Preparedness & Response Institute (HKJCDPRI), launched in 2014, is focused on establishing an evidence base in support of “effective disaster preparedness and response, both for Hong Kong and the Asia Pacific region.” This policy brief proposes a detailed agenda for the HKJCDPRI Center of Excellence in Disaster Preparedness and Response. 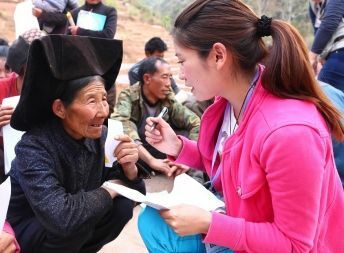 Acknowledging the growing global shift from top-down emergency response systems to contextualized community-specific approaches, and the WHO-led coordination and standardization of Emergency Medical Teams, this brief outlines a research and training agenda that prioritizes community resilience. 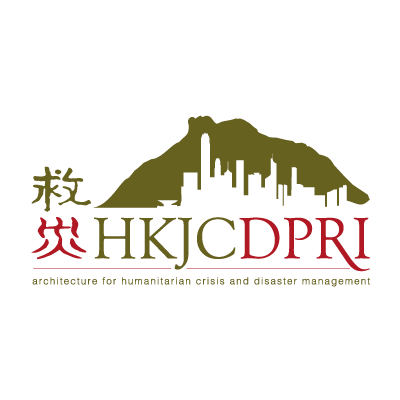 This policy brief is a part of the related research of the HKJCDPRI 5-year project. 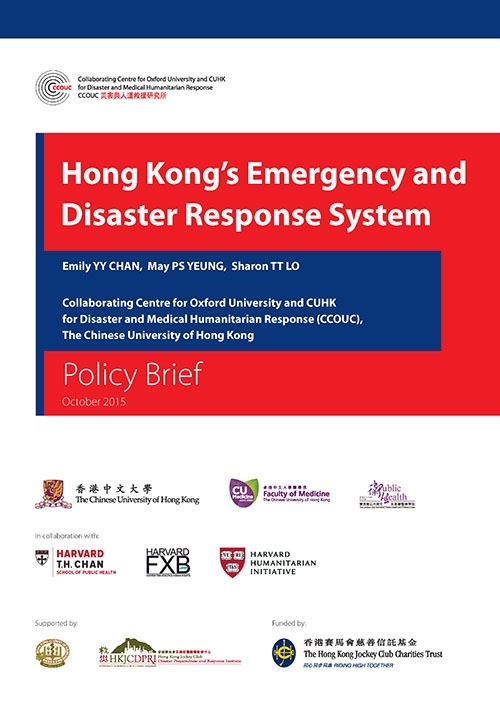 It outlines the existing emergency and disaster response system, a 3-tier system currently operating in the Hong Kong Special Administrative Region (HKSAR). Despite past epidemics, there remains a low level of community awareness, participation in basic first aid training and emergency preparedness. (The link to the full article is under "To Know More" on the right) Prehosp Disaster Med. 2015;30(2):1-7 Anisa J. N. Jafar1, Ian Norton2, Fiona Lecky3 and Anthony D. Redmond1 1 HCRI, Ellen Wilkinson Building, University of Manchester, Manchester, United Kingdom2 National Critical Care and Trauma Response Center, Darwin, Australia3 EMRiS Group, ScHARR, Sheffield, United Kingdom Background Medical records are a tenet of good medical practice and provide one method of communicating individual follow-up arrangements, informing research data, and documenting medical intervention. Medical records are a tenet of good medical practice and provide one method of communicating individual follow-up arrangements, informing research data, and documenting medical intervention. 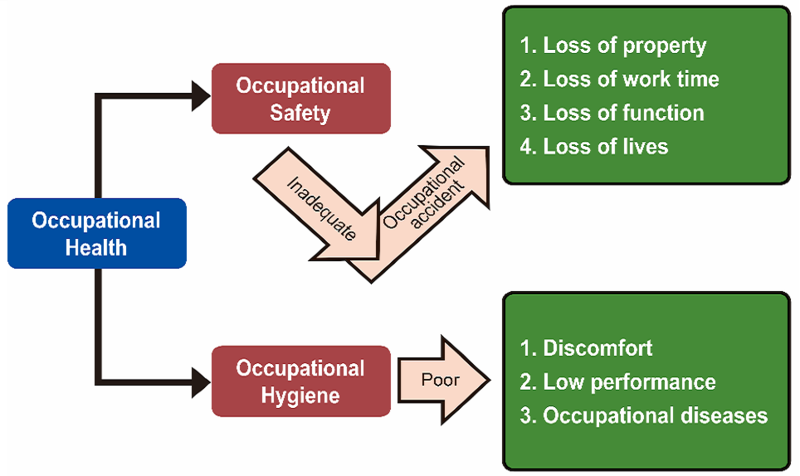 The objective of this review was to look at one source (the published literature) of medical records used by foreign medical teams (FMTs) in sudden onset disasters (SODs). The published literature was searched systematically for evidence of what medical records have been used by FMTs in SODs. The style and content of medical records kept by FMTs in SODs varied widely according to the published literature. Similarly, there was great variability in practice as to what happens to the record and/or the data from the record following its use during a patient encounter. However, there was a paucity of published work comprehensively detailing the exact content of records used. Without standardization of the content of medical records kept by FMTs in SODs, it is difficult to ensure robust follow-up arrangements are documented. This may hinder communication between different FMTs and local medical teams (LMTs)/other FMTs who may then need to provide follow-up care for an individual. Furthermore, without a standard method of reporting data, there is an inaccurate picture of the work carried out. 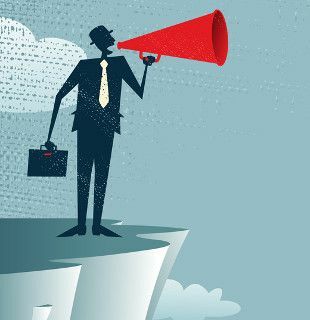 Therefore, there is not a solid evidence base for improving the quality of future response to SODs. 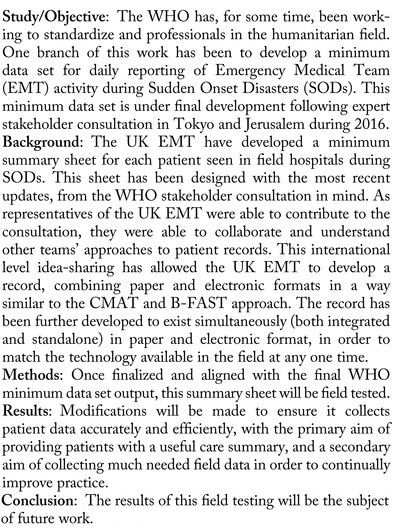 Further research targeting FMTs and LMTs directly is essential to inform any development of an internationally agreed minimum data set (MDS), for both recording and reporting, in order that FMTs can reach the World Health Organization (WHO) standards for FMT practice.